How to improve power factor ? Power factor has been defined earlier as a function of active and apparent power. For sinusoidal (undistorted) voltage and current, a vector representation is also possible and helpful. 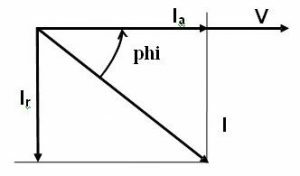 For most electrical loads like motors, the current I is lagging behind the voltage V by an angle phi. Ia is called the “active” component of the current. Ir is called the “reactive” component of the current. The above diagram drawn up for currents also applies to powers, by multiplying each current by the common voltage V.
The physical unit for the reactive power is one volt-ampere-reactive (var), with one kilovolt-ampere-reactive (kvar) often used for commodity. Thus, the supply source has to provide not only the active power P, but also the reactive power Q, resulting in the apparent power S.
It can be easily seen from figure above that for a given active power P, there is a great benefit to decrease the phase angle phi, so that the apparent power and the corresponding current could be reduced. The principle of “Power Factor Correction” (or “Reactive Energy Compensation”) is to generate the reactive power close to the load, so that the supply source could be relieved. Capacitors are most commonly used to supply reactive energy to inductive loads such as motors. Qc is the reactive power produced by the capacitors. S’ is the apparent power after compensation. 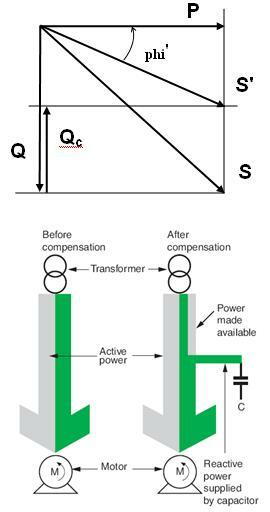 Capacitor bank s can be arranged to provide a fixed value of reactive energy or variable values by steps. For highly fluctuating loads such as lifts, crushers …, electronic compensators have been designed in order to provide fast and continuously varying compensation. or copy this trackback: http://engineering.electrical-equipment.org/power-quality/6-8-improve-power-factor.html/trackback from your own site. Very amazing and nice post sir, but i have a question that whether we can reduce our electricity bill by power factor correction? when the reactive power is supplied by capacitors the power factor will get improve. this leads to decrease in power consumption too. the power is the rms of reactive and apparent power. so, it causes the reduction in power consumed and the charge you r supposed to pay for the electricity department will get reduced. hello surya…. after looking vector diagram above,, it shows reactive lessen and power factor corrected but the apparent power is still the same… no change..
fundamentals remains the same wheather it is used for home or industries. kindly check the Pf at ur home which would be probably .9 and around which is good enough. offcoures if u are not using hevay AC in ur home. Good post Sir,But what is new ?Capacitor banks are mostly used either in industrial loads and at Power system supply side. Dear Farhan we can reduce bills by power factor correction but for commercial loads the power factor is of not so importance. Why do you think that power factor is not so important for commercial loads? Bill can be reduced only if surcharge for low power factor/reactive power charges are in the tariff. As of now domestic and most of the low demand LT loads do not attract such charges. nice to read ur article……..may i know the difference between power factor and Q factor..??? The illustrations for pf improvement deals generally with fixed loads. What about varying loads? How variable reactive power is produced at consumer end and at what cost and efficiency? Is it necessary that every piece of equipment work at unity power factor or is it economical to take care at the aggregate level? 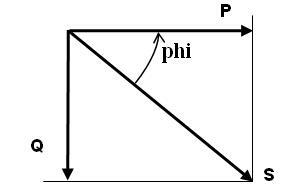 power factor is cosine angle between voltage and crt.